Western blot analysis of extracts from HeLa cells transfected with 100 nM SignalSilence® Control siRNA (Unconjugated) #6568 (-) or SignalSilence® β-Arrestin 1 siRNA I (+) using β-Arrestin 2 (C16D9) Rabbit mAb #3857 (upper) or α-Tubulin (11H10) Rabbit mAb #2125 (lower). 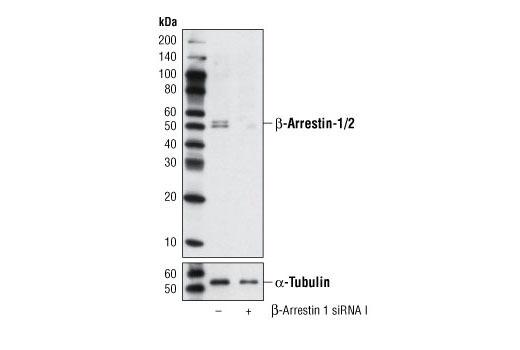 The β-Arrestin 2 (C16D9) Rabbit mAb confirms specificity of β-Arrestin 1 siRNA I, while the α-Tubulin (11H10) Rabbit mAb is used as a loading control. Western blot analysis of extracts from HeLa cells transfected with 100 nM SignalSilence® Control siRNA (Unconjugated) #6568 (-) or SignalSilence® β-Arrestin 1 siRNA I (+) using β-Arrestin 1/2 (D24H9) XP® Rabbit mAb #4674 (upper) or α-Tubulin (11H10) Rabbit mAb #2125 (lower). 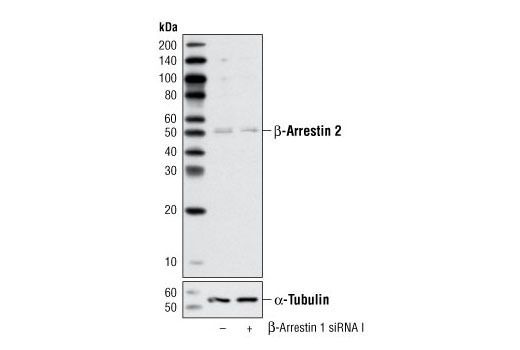 The β-Arrestin 1/2 (D24H9) Rabbit mAb confirms silencing of β-Arrestin expression, while the α-Tubulin (11H10) Rabbit mAb is used to control for loading and specificity of β-Arrestin 1 siRNA. CST recommends transfection with 100 nM β-Arrestin 1 siRNA I 48 to 72 hours prior to cell lysis. For transfection procedure, follow protocol provided by the transfection reagent manufacturer. Please feel free to contact CST with any questions on use. SignalSilence® β-Arrestin 1 siRNA I from Cell Signaling Technology (CST) allows the researcher to specifically inhibit β-arrestin 1 expression using RNA interference, a method whereby gene expression can be selectively silenced through the delivery of double stranded RNA molecules into the cell. All SignalSilence® siRNA products from CST are rigorously tested in-house and have been shown to reduce target protein expression by western analysis.